The trapping of hydrogen in nanostructured bainitic steel has been investigated using thermal desorption analysis, in order to determine the potency of the ferrite-retained austenite (α/γ) interfaces and retained austenite as trapping sites. 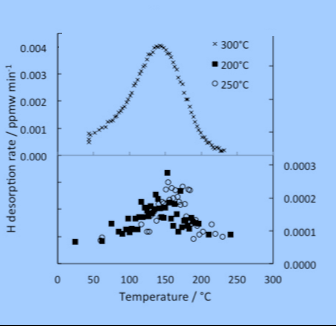 Thermal desorption data showed that the volume of retained austenite is more effective in trapping hydrogen than the interfaces. There is a close correlation between the quantity of hydrogen and the retained austenite content rather than the density of interfaces. A local equilibrium model was able to reproduce the hydrogen desorption behaviour of saturated and unsaturated samples considering both retained austenite and α/γ interfaces as the trapping sites. A trap binding energy ranging from 47-52 kJ/mol was estimated for retained austenite, suggesting that the observed trapping capacity originates from the austenite lattice sites. Materials Characterization 134 (2017) 96-102.